Flamingo (plural: flamingos or flamingoes) is the common name for any of the large, gregarious, wading birds comprising the family Phoenicopteridae, characterized by long legs with webbed feet, a long, thin, and flexible neck, a short tail, typically pink or reddish plumage, and a unique bill, specialized for filter feeding, that is curved downward at the tip. Flamingos are found in both the Old World and New World. Generally, a single extant genus, Phoenicopterus, with six extant species is recognized, with four of the species native to the Americas and two living in parts of Africa, Europe, and Asia. Some authorities recognize five species (Grzimek et al. 2004; ITIS 1998b) and some recognize a second extant genera in Phoenicopteridae, with the Andean flamingo and the James's flamingo often placed in the genus Phoenicoparrus instead of Phoenicopterus. While ecologically important as part of food chains, for humans flamingos particularly are valued for aesthetic purposes, being popular sights given their colorful appearance, large size, unique behavior (such as standing on one leg), and gregarious nature, sometimes flying or feeding in very large flocks. They are important both in ecotourism and as seen in zoos. Flamingos constitute the family Phoenicopoteridae, which is generally placed in its own order Phoenicopteriformes (Grzimek et al. 2004), but also is sometimes placed in the order Ciconiiformes with such birds as auks, herons, ibises, and storks (ITIS 1998a, 2004). Generally one modern genus of Phoenicopteridae is recognized, Phoenicopteridae (ITIS 1998a, 1999b), but sometimes the extant flamingos are separated into additional genera (Grzimek et al. 2004). All species of flamingos are very long-legged, and long-necked water birds with down-curved bills adapted for filter feeding (Grzimek et al. 2004). They have webbed feet, large wings, and a short tail. Flamingos are slender-bodied and large in size, ranging from 80 to 160 centimeters (31.5 to 63 inches) in height and from 2.5 to 3.5 kilograms (5.5 to 7.7 pounds) in weight (Grzimek et al. 2004). Young flamingos hatch with gray plumage, but adults range from light pink to bright red due to aqueous bacteria and beta carotene obtained from their food supply. A well-fed, healthy flamingo is more vibrantly colored and thus considered a more desirable mate. A white or pale flamingo, however, is usually unhealthy or malnourished. Captive flamingos are a notable exception; many turn a pale pink as they are not fed carotene at levels comparable to the wild. 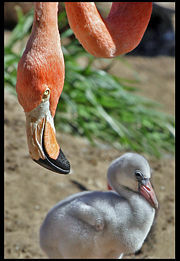 This is changing as more zoos begin to add prawns and other supplements to the diets of their flamingos. Zoo-fed flamingos may be given food with the additive canthaxanthin, which is often also given to farmed salmon. Black and white plumage also is part of the flamingos natural color, such as the black tips of the wings of Phoenicopterus ruber. Flamingos are found in tropical and subtropical areas of the New World and Old World, including in southern North America, the Caribbean, and South America, and the Galapagos Islands, Africa, Madagascar, southern Europe, southwest Asia, the Middle East, and the Indian subcontinent (Grzimek et al. 2004). While typically tropical, they can be found in the high Andes of South America. They typically inhabit areas with shallow saline, brackish, or alkaline water (Grzimek et al. 2004). 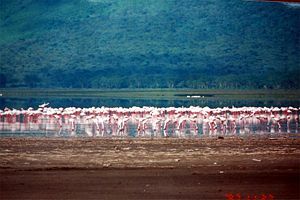 Caribbean flamingos, many standing on one leg, in Lago de Oviedo, Dominican Republic. Flamingos are gregarious animals, flocking in large numbers (hundreds or even millions). When wading, flamingos frequently stand on one leg. The reason for this behavior is not fully known. One common theory is that tucking one leg beneath the body may conserve body heat and keep the legs from getting wet. Flamingos filter-feed on tiny mollusks and crustaceans, such as brine shrimp, utilizing their sieve like bills to capture the prey. They may stamp their webbed feet in the mud to stir up food from the bottom. Their oddly-shaped beaks are specially adapted to separate mud and silt from the food they eat, and are uniquely used upside-down. The filtering of food items with their bills are assisted by hairy structures called lamellae, which line the mandibles, and the large rough-surfaced tongue. The shrimp and blue-green algae consumed are common sources of the beta carotene needed for their characteristic pink/reddish coloring. Flamingos produce a "milk" like pigeon milk due to the action of a hormone called prolactin. It contains more fat and less protein than that of pigeons, and it is produced in glands lining the whole of the upper digestive tract, not just the crop. Both parents nurse their chick, and young flamingos feed on this milk, which also contains red and white blood cells, for about two months until their bills are developed enough to filter feed. Six species of flamingos are currently recognized. Some taxonomies recognize five species (ITIS 1998a, 1998b), with the Caribbean flamingo (Phoenicopterus ruber) considered a subspecies of the greater flamingo (P. roseus); however, in 2002 the British Ornithologists Union recognized the pinker Caribbean population as a separate species (Showler 2008). Old World Parts of Africa, southern Europe, and southern and southwestern Asia (most widespread flamingo). Africa (e.g. Great Rift Valley) to northwestern India (most numerous flamingo). New World Temperate southern South America. High Andes in Peru, Chile, Bolivia, and Argentina. Andean Flamingos in the Laguna Colorada, Bolivia. The identity of the closest relatives of the flamingos is a rather contentious issue. Traditionally, the long-legged Ciconiiformes, probably a paraphyletic assemblage, have been considered the flamingos' closest relatives and the family was included in the order. Usually the spoonbills and ibises of the Threskiornithidae were considered their closest relatives within this order. Some taxonomies still place Phoenicopteridae within Ciconiiformes (ITIS 1998a, 2004). Nevertheless, relationships to the Anseriformes (waterfowl) were considered as well (Sibley et al. 1969), especially as flamingos and waterfowl are parasitized by feather lice of the genus Anaticola (Johnson et al. 2006). To reflect the uncertainty about this matter, flamingos began to be placed in their own order later on. Other scientists proposed flamingos as waders most closely related to the stilts and avocets, Recurvirostridae. The peculiar presbyornithids were used to argue for a close relationship between flamingos, waterfowl, and waders (Feduccia 1976), but they are now known to be unequivocal waterfowl with a peculiarly derived morphology paralleling waders and flamingos. In recent years, molecular and anatomical studies have yielded confusing results. Some placed flamingos within an expanded (and certainly paraphyletic, as is now known) Ciconiiformes. On the other hand, long it has been the grebes (Podicipedidae), rather than Ciconiiformes, ducks, or stilts, that were time and again indicated as the closest relatives of flamingos, and there is currently renewed interest in this hypothesis (Mayr 2004). In a 2004 study comparing DNA sequences of intron 7 of the β-fibrinogen gene (FGB-int7), the Neognathae (all living birds except the ratites and tinamous) excluding waterfowl and Galliformes were shown to be divided into two subgroups of uneven size. The first and smaller one, Metaves, contains flamingos and grebes, alongside the hoatzin, pigeons, sandgrouse, the Caprimulgiformes, the Apodiformes, tropicbirds, mesites, sunbittern, and kagu. Interestingly, most of these groups have traditionally been difficult to place on the family tree of birds. According to this study, all other birds belong to the second subgroup of Neoaves, the Coronaves (Fain & Houde 2004). But the molecular data was insufficient to resolve inter-Metaves relationships to satisfaction; the flamingo FGB-int7 sequence is apparently most similar to that of some species of nighthawks, strongly suggesting a case of convergent evolution on the molecular level. The conclusions that one can draw from this study are twofold: first, that flamingos are Metaves (if that group is not based on molecular convergence, for which there are some indications), and second, that FBG-int7 is unsuitable to determine their relationships beyond that. It is interesting to note, however, that among all the groups which have been proposed as sister taxa of the flamingos, only the grebes are Metaves. The relationships of the flamingos still cannot be resolved with any certainty, but presently a close relationship with grebes appears somewhat more likely than other proposals. For this clade, the taxon Mirandornithes ("miraculous birds" due to their extreme divergence and apomorphies) has been proposed. In summary, all this confusion serves to show that all lines of "evidence"—molecular, morphological, ecological, and parasitological—are liable to yield erroneous "proof" and that no method can be considered generally superior. Any future attempt to finally resolve the flamingos' relationships, therefore, would have to employ total evidence to support it and carefully weigh the data against alternative proposals. Caribbean flamingo at National Zoo Washington, DC. ↑ The supposed "Cretaceous flamingo" Parascaniornis is actually a Baptornis and not a close relative to any living bird. BirdLife International. 2004. Phoenicopterus roseus. 2006 IUCN Red List of Threatened Species. Retrieved July 14, 2008. BirdLife International. 2006. Phoenicopterus minor. 2007 IUCN Red List of Threatened Species. Retrieved July 14, 2008. Fain, M. G., and P. Houde. 2004. Parallel radiations in the primary clades of birds. Evolution 58 (11): 2558-2573. Retrieved July 14, 2008. Feduccia, A. 1976. Osteological evidence for shorebird affinities of the flamingos. Auk 93(3): 587-601. Retrieved July 14, 2008. Hilty, S. L. 2003. Birds of Venezuela. London: Christopher Helm. ISBN 0713664185. Integrated Taxonomic Information System (ITIS). 1998a. Phoenicopteridae. ITIS Taxonomic Serial No. : 174974. Retrieved July 14, 2008. Integrated Taxonomic Information System (ITIS). 1998b. Phoenicopterus Linnaeus, 1758. ITIS Taxonomic Serial No. : 174975. Retrieved July 14, 2008. Integrated Taxonomic Information System (ITIS). 1999. Phoenicopteriformes. ITIS Taxonomic Serial No. : 553433. Retrieved July 14, 2008. Integrated Taxonomic Information System (ITIS). 2004. Ciconiiformes. ITIS Taxonomic Serial No. : 174770. Retrieved July 14, 2008. Johnson, K. P., M. Kennedy, and K. G. McCracken. 2006. Reinterpreting the origins of flamingo lice: Cospeciation or host-switching? Biology Letters 2: 275–278. Retrieved July 14, 2008. Mayr, G. 2004. Morphological evidence for sister group relationship between flamingos (Aves: Phoenicopteridae) and grebes (Podicipedidae). Zool. J. of the Linnean Soc. 140: 2. Sibley, C. G., K. W. Corbin, and J. H. Haavie. 1969. The relationships of the flamingos as indicated by the egg-white proteins and hemoglobins. Condor 71(2): 155-179. Retrieved July 14, 2008. Showler, B. 2008. Where to find flamingos: Birdwatching at Snake Bight in Florida's Everglades National Park: The heart of the Everglades is the best place in America to find our pinkest, most flamboyant bird. Retrieved July 15, 2008. Svensson, L., D. Zetterström, K. Mullarney, and P. J. Grant. 1999. Collins Bird Guide. London: HarperCollins. ISBN 0002197286. Ubilla, M., D. Perea, C. Tambussi, and E. Tonni. 1990. Primer registro fósil de Phoenicopteridae (Aves: Charadriiformes) para el Uruguay (Mio-Plioceno). Anais da Academia Brasileira de Ciências 62: 61-68. This page was last modified on 17 August 2016, at 18:54.